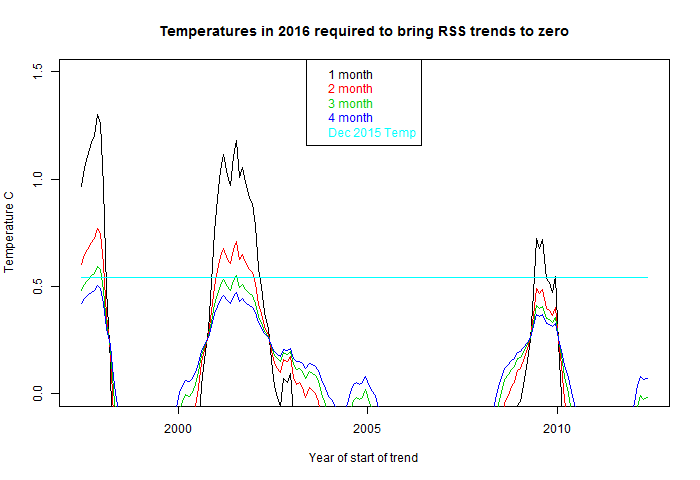 At WUWT, there is a monthly post (latest here recording the duration of the Pause, which Lord Monckton defines as the maximum time back that a satellite index, RSS, can be found to have trend less than zero. The choice of that index, which measures an average of troposphere temperature by a complex analysis of data from several satellites, is necessary because all of the better known surface temperature indices have rising trends for all recent periods. So there is lots of cherry picking. You can see what is actually going on in this calculation in the following back trend graph (from this active plotter). The graph shows, for various indices, the trend from the year on the x axis to present (Dec 2015). You can see the cherry picking in the choice of index. RSS is the lowest green curve. It now has UAH V6 beta for company, but only recently; V5.6, still being published, was up with the surface indices. The Pause starts from the first crossing of the x-axis, which I've marked with a red circle. But you'll see that even so, most of the curve is positive. The excursions below the axis are brief and shallow, and about to come to an end. In fact the shape is not too far from an inverted image of the time series itself. The big temperature peak in 1998 shows as a dip, while the following trough shows as a local peak in trend. That is why the "pause" has persisted - because of the very big 1998 peak which depresses subsequent trends. If the January anomaly exceeds about 1.3°C, the Pause is gone. This is unlikely. If the Jan and Feb anomalies exceed on average about 0.77°C, the curve will be above the axis. For reference, the Dec anomaly was 0.543°C. I think this is quite likely. If the first three months exceed 0.59°C on average, that would suffice to extinguish the pause. That is barely above the December value, and I think very likely indeed. If Jan-April exceed 0.5°C, that will also suffice. I'll explain the arithmetic below the fold. where N is the number of months in the trend. For two successive months, two such functions, with just one non-zero at the end, are added. They are displaced by a month, but that has small effect. To good approx, the effect on trend is the same as if the sum of residuals applied for just one month. And so on for three or four months (slightly less good approx). Here is a plot showing for each starting month d0 the temperature required for the added months to bring the trend to zero. For more than one month, it is an average. You can ignore all but the high parts; the plot also shows which cool temperatures will reduce a positive trend to zero. You'll see that, although the trend dips below zero around 2001 and 2008 are bigger now than in 1997, the arithmetic works so that once the dip at 1997 is eliminated, the other dips have already gone. The increase in 1998 is large and sustained, and 2016 starts from a much higher base. Wont there always be a pause, no matter how warm it gets? The "Pause" will exist only in the past. Pause Aficionados will have to cherry-pick both the start date and end date. Fortunately, however, temperatures are unlikely to rise monotonically forever. So at some point there will be a new Pause to replace the old one. Get ready for "No Statistically Significant Warming Since Mid-2016". Just another step for the SkS "escalator" graph. There never has been a pause, just a fairly constant trend with natural variability going up and down around the trend. The 97/98 (El Niño) is a high excursion above the trend, but that does not make a pause. Pause in global warming, no, but pause in surface air temperature yes. If not, why so many studies about small volcanoes, heat burial in the Pacific and arctic warming. Surface warming paused but not global warming. As for y ur link, one may be a great statistician, it can be helpfull to be a little bit more simple. To me the critical signature of global warming is the presence of a top-of-atmosphere imbalance in radiative energy produced by an enhanced greenhouse effect. Since ~93% of any energy-excess imbalance goes into the world's oceans, a time series showing increasing thermal content of the oceans is diagnostic of global warming. Any pause in the TOA imbalance should show up in the ocean heat content data. The data from the relatively new ARGO system, now up to ~4000 floats worldwide, measuring the heat content from 0-2000 meters, shows no pause whatsoever in the TOA imbalance. If anything it shows a small acceleration in the past 5 years. The OHC data, updated through December, 2015, is provided by NOAA here: http://www.nodc.noaa.gov/OC5/3M_HEAT_CONTENT/basin_data.html and the corresponding plots shown here: http://www.nodc.noaa.gov/OC5/3M_HEAT_CONTENT/index.html. The enormous heat capacity difference between the oceans and the atmosphere makes the latter fluctuate wildly (well alot anyway) when ocean-atmosphere heat transfers like ENSO occur. I was wondering how the advocates of the ‘hiatus’ would handle it when the hernia finally ruptured. I note with much bemusement the attempt by Ken Stewart to prolong the agony for the UAH6 data by smoothing the data by 12 month averaging (see https://kenskingdom.wordpress.com/2016/01/17/trending-trends/) . Of course this smooths out the recent rise and gives the hiatus a month or so of breathing space but this just delays the inevitable. The statistical significance of the hiatus for the raw data was always questionable to say the least (currently for the first cherry pick date of June 1997 the unbiased 95% confidence intervals for the linear regression are approximately plus or minus 60 times the slope!) . If this was not ludicrous enough, for the data that has been averaged over 12 months and taking into consideration serial correlation ( I know why bother) the confidence levels would be even more extreme. These people need to directly bypass three stages of grief and move from denial to acceptance (without passing go). To the more important long-term stuff, is the January GISS anomaly going to exceed the GISS anomaly for December 2015, 1.12C. Looks to me like it can, narrowly. 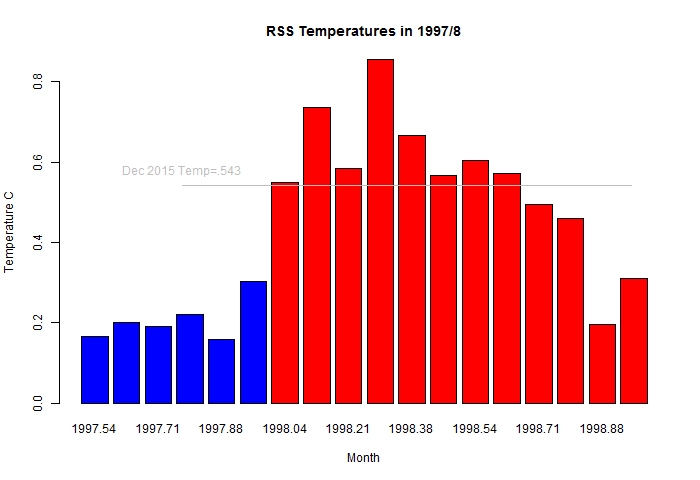 RSS and UAH : january 2016 higher than jan 1998. But not such a big step from december to january. Thanks, all. I have a new post up. History of record warm years. An old WUWT SST blooper back to life. Checking the Moyhu NCEP/NCAR index.